Of course, few Realtors do that. Our direct mail campaigns have far better results because they carefully target specific homes, selected for very specific reasons. It also helps if you know something about the owner. 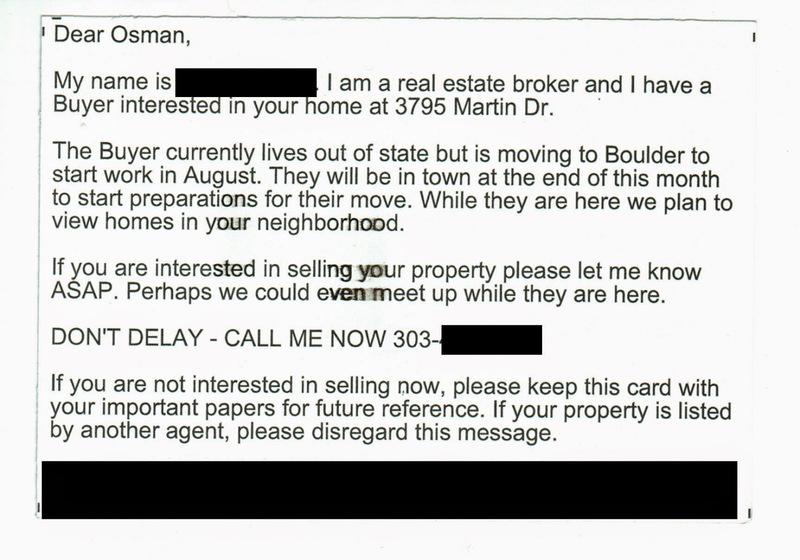 Pro tip: If your agent can't take a few minutes to cross reference the Boulder Realtor list with their mail merge, they're not doing a very good job. They're certainly not willing to invest serious resources to find you an unlisted property. And that's what it takes, serious resources for a serious effort. Shotgun blasting a cheap postcard yields very low results, but like Momma said.... you get what you pay for. To that buyer who hired this Realtor? Prepare for disappointment.